Home > CULTURE > Summer is the season for Kabutomushi, Japanese beetles! Summer is the season for Kabutomushi, Japanese beetles! Summer is here, and besides the warm weather, festivals and fireworks it’s the perfect time for kabutomushi. If you aren’t sure what that is! it’s a giant beetle with horns. Honestly it’s the ugliest thing I ever saw. 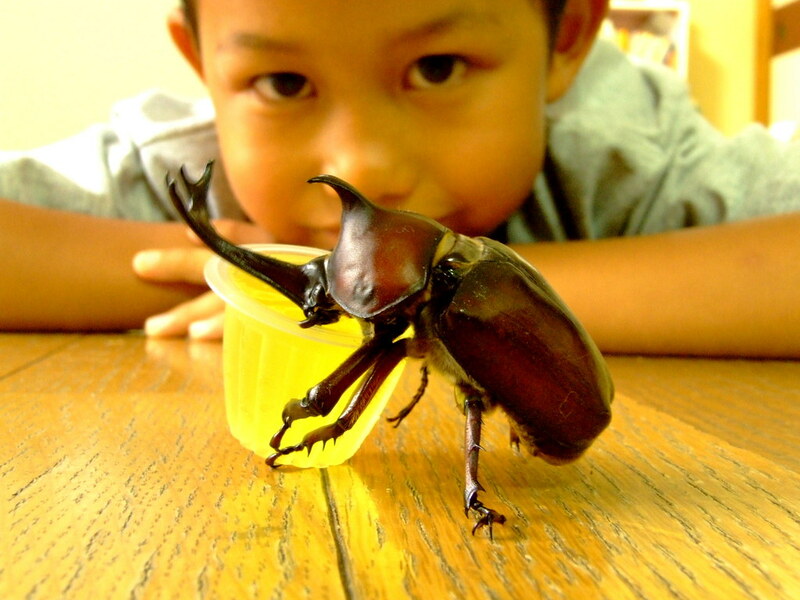 It is known as the Japanese rhinoceros beetle. But it just so happens to be a crucial experience for many children in Japan, especially in summer. Anime, advertisements, television and certain films have all contributed to making these pets a popular part of childhood in Japan. During the summer, many children spend afternoons or evenings trying to catch these beetles to bring them home as pets. Lots of children actually look forward to catching them and some families have made it a tradition. If you can’t catch one, you can always buy them at local pets shops. They aren’t very expensive and should be run you 500-1000yen. These beetles don’t have a very long life, the male will die in about 4 weeks and the female will continue to live until she lays her eggs. The babies will live approximately one year. Make sure to take care of them by keeping them hydrated, giving them lots of leaves, and giving them lots of jellies. It’s better to have them in male and female pairs so if you can get two. They can also fly so be sure to keep them safe. Happy hunting. Stuck at home? Go Out on a Tour! Fashion Trends: The salmon swimming up stream!